The Promo-Trailer feature allows for custom promotional messages to be appended to the normal Scrolling Rotation (VRS) displayed on the Auxiliary Screen and on Songbooks Online Apps (if subscribed). 1. Enter individual "cycling" messages by placing each "cycling" message on a separate line within the edit box (A). 2. Optionally utilize the Edit Buttons (B) to customize your Promo-Trailers. 3. After creating your Promo-Trailer(s), you may save them for later recall by clicking the "Save" button (D). 4. Reload previously saved Promo-Trailers by utilizing the "Prev" and "Next" buttons (D). 5. Delete a saved Promo-Trailer by first selecting it and clicking "Delete" (D). 6. Optionally designate the selected Promo-Trailer(s) to automatically reload each time you launch CompuHost by activating the "Auto-load selected Promo-Trailer on startup" option (C). 7. After designing and/or selecting your Promo-Trailers, simply click the "Set Promo-Trailers & Exit" button (E). Between Karaoke performances, your selected Promo-Trailers are also automatically displayed within the Songbooks Online Apps of users currently logged into your show! We realize there may be occasions whereby you wish to limit certain Promo-Trailers to specific destinations (Onscreen Scroller, Songbooks Online Apps, or both). To facilitate this, simply place the applicable tag (below) at the beginning of the desired Promo-Trailer line (F). <APP> Cycling Promo-Trailers (lines) that begin with this tag are displayed on Songbooks Online Apps only! 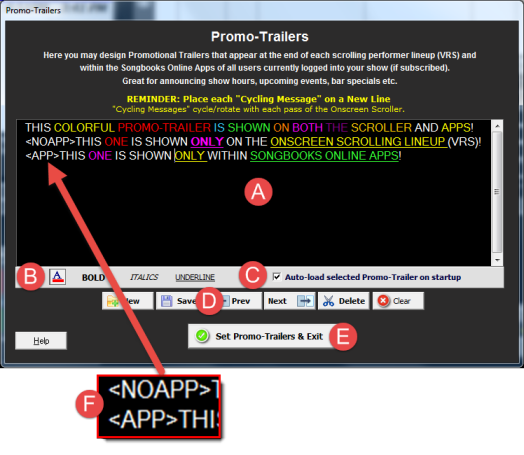 <NOAPP> Cycling Prom-Trailers (lines) that begin with this tag are displayed on the Onscreen Scroller only! REMINDER: Cycling Promo-Trailers (lines) that do not begin with either tag will be displayed on both the Onscreen Scroller and Songbooks Online Apps.